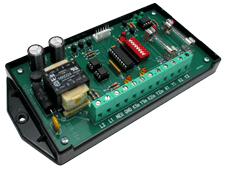 The RTR-22+ high-speed pulse isolation relay is designed to interface two pulse channels from water or gas meters to other systems. Two independent channels, each with their own Form A input and a corresponding Form A (K & Y) isolated solid-state dry contact output. Most water and gas meters with a pulse output will interface to the RTR-22+’s input, whether it is an open-collector transistor, open drain FET, MOSFET solid state relay, read switch or a dry-contact relay. The input is activated when the input (Y) is switched from its “pulled up” state to ground (K) for at least a minimum pulse time. Four input filter times are field-selectable: 50 microseconds, .5, 5 or 20 milliseconds. When the RTR-22+ relay is inserted in the two-conductor cable between the water or gas meter and the remote equipment, it provides a replicated signal to the remote equipment, provides a separate isolated (dry contact) Form A contact closure for use with customer-owned monitoring equipment. Typical applications involve pulse counting, monitoring and recording of water or gas usage. Other applications include interfaces between utility metering devices and customer-owned building automation systems, control and monitoring systems, usage recorders, automated meter reading systems and supervisory control and data acquisition systems (SCADA). Bright yellow LED lamps, one for each of the RTR-22+’ inputs, indicate the channels’ input status at all times, thus allowing the field technician to visually observe pulses being received from the water or gas meter. A bright green LED visually shows each channel’s output status. The microcontroller-based RTR-22+ checks each incoming pulse for its duration. If the incoming pulse is less than the input filter time selected, the RTR-22+ assumes the incoming pulse to be noise and it is rejected. If used in a very noisy environment this “pulse acceptance window” may be lengthened or shortened as needed to reject noise by selecting a different input filter time. The RTR-22+ has two modes on the output operation: normal and fixed. The normal mode’s output follows the input so the duty cycle on the out is a mirrored image of the input and timing is approximately the same. In the fixed mode, each channel has an output closure time selected, either 50, 100, 200, or 500 milliseconds. Pulses can either be “stretched” or shortened to suit the receiving equipment. In the event that the input pulse rate exceeds the output time such that input pulses are arriving from the meter faster than the output can handle, the microcontroller stores up to 255 pulses and outputs them in a 50/50 duty cycle as soon as possible so that no pulses are lost. If more than 255 pulses are stored, then a RED LED lights indicating a count register overflow. Input and output terminals are “Euro” type connector for easy field wiring and excellent isolation. The “K” lead of the RTR-22+’s outputs are fused and have built-in transient protection for the solid-state relay’s. All component parts that have power applied to them, with the exception of the input/output terminal strip are enclosed in a polycarbonate cover for maximum user protection. The mounting base plate is made of polycarbonate and offers excellent electrical insulation between the circuit and the mounting surface. RTR-22+ models are designed for mounting in an electrical enclosure appropriate for the application and operating environment. 125 VDC input using the DSC-1 Power Supply. Contact factory for other input voltages and special orders. Wetting Voltages: External wetting voltage available: 5VDC, 12VDC, 24VDC.